1. Elephant Butter Dish – I love all things elephant. I even have an elephant pot holder in my living room. Obviously, I adore this. 2. Sprouted Kitchen Cookbook – This cookbook is definitely on the top of my wish list. Head on over to the Sprouted Kitchen blog to see the delicious food and beautiful photography of which this cookbook is made. 3. 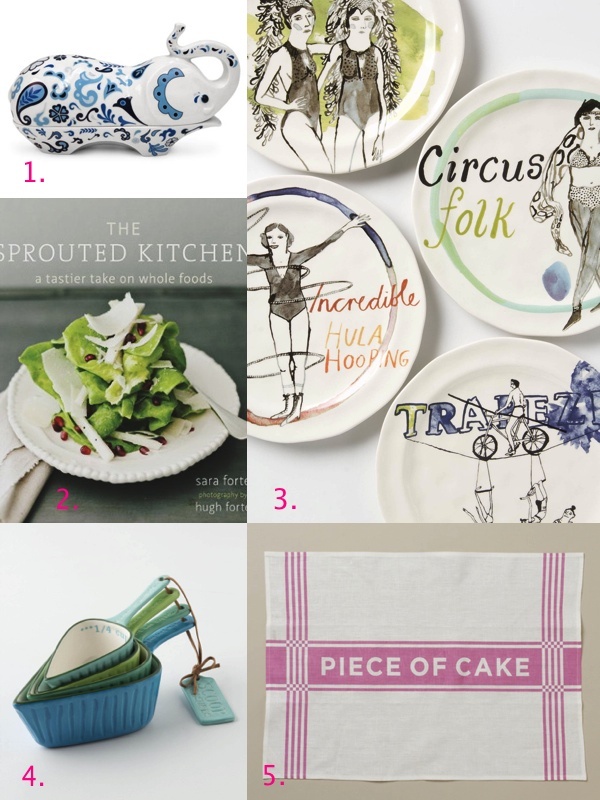 Circus Dessert Plates – One can never have too many dessert plates. 4. Spades Measuring Cups – Love the color and shape of these. 5. Piece of Cake Tea Towel – How precious is this? I’m thinking a set of these would go perfectly in my kitchen.